We are building a beautiful new 24,000 sq. ft. health center, located at 5925 W. Las Positas Blvd. in Pleasanton, that will open in 2016. The new clinic will double our current capacity, and enable Axis to provide 42,000 behavioral health visits and 60,000 medical visits each year. All of Axis's current sites will remain open. $1,000 will purchase an otoscope and ophthalmoscope set up for an exam room. This is what doctors use to check ears and eyes as part of every exam. It is a must have…and 27 are needed! $750 will purchase a pre-natal Doppler for listening to a baby’s heartbeat in utero. For the more than 300 women who rely on Axis for prenatal care, hearing that baby’s heartbeat is not just assurance of a healthy baby, it’s a remarkable moment. The new clinic will need four pre-natal Dopplers..
$500 will buy a microscope which is used to diagnose infections and illnesses. When doctors are able to make a diagnosis right away by using a microscope rather than sending a sample out to a lab, patients can begin treatment immediately and have better, quicker and healthier outcomes. $250 will buy an infant scale for weighing infants during their first critical year. These regular checkups are essential to insuring their good health. 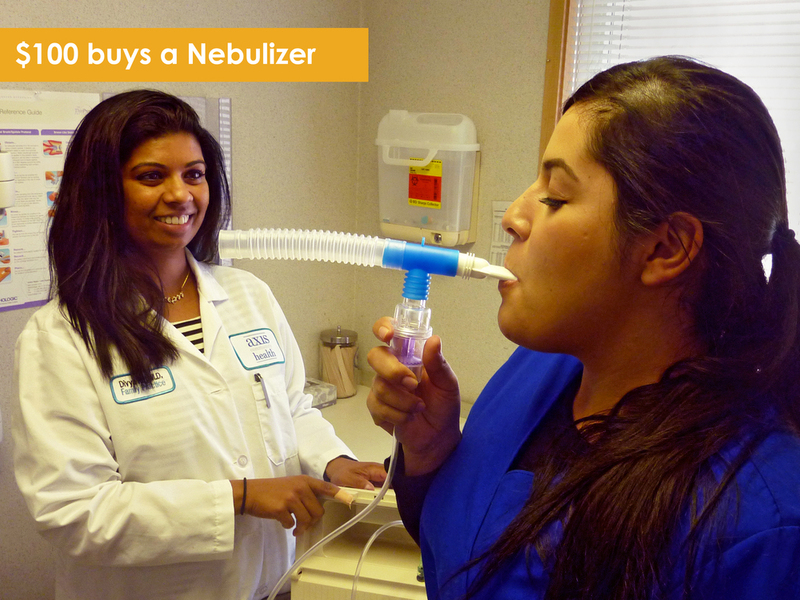 $100 will buy Nebulizers that are essential to treating kids who are having an acute asthma attack and helps them begin breathing normally again. Every donation, no matter the amount, helps. Axis is a non-profit organization; your gift is fully tax-deductible. Donors will be listed on our Donor Honor Roll, gifts of $5,000 or more will be recognized on the Major Gift Wall. For more information, click here. Yes, I want to give the gift of health!